Are you experiencing pain in your mouth? Perhaps even throughout your jaws and around your ears? Are you constantly biting your cheeks and gums?. Or maybe you have no symptoms but your dentist recommended an evaluation. You'd be surprised how often our own wisdom teeth can turn against us, and the result can be devastating in certain cases . 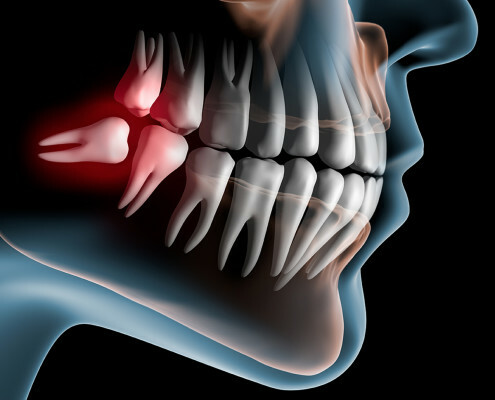 Many patients with impacted or non-impacted wisdom teeth experience at least one of these issues in their life. For this, we often perform removal or partial removal of wisdom teeth in order to alleviate or prevent these issues. Luckily, wisdom teeth are so far back in our mouths, that we don't even use them for chewing or anything meaningful. For the same reason, they are very difficult teeth to clean and keep cavity-free. It really seems like these teeth are all-liability and no-benefit... This is why your dentist may have recommended extraction of your wisdom teeth, even if they have not been bothering you, as a means of prophylactic management. Every tooth and every patient is different; We have 3D and 360 degree imaging to pick the perfect customized treatment for you. Come speak to one of our surgeons about your wisdom teeth, and the many treatment and anesthetic options available to you. Just Had Wisdom teeth surgery? Tooth decay can lead to all sorts of issues; If left unchecked, they can cause painful infections. Sometimes decay and infections can persist even after fillings and crowns and root canals. There comes a point where this persistent insult to our teeth, bone, and gums can deem a tooth non-restorable or periodontally hopeless; this results in the need for dental extraction. Sometimes patients have extra teeth, or even suffer from severe orthodontic crowding; as such, your dentist may also recommend extraction of certain teeth to help alleviate the resulting symptoms. Our surgeons at OMA have excellent training and experience in the management of all types of extractions. Whatever the reason or situation; our surgeons can take care of your dental extraction in a skilled and comfortable manner. Come see us for your dental extraction!